I am in dire need of a weekend morning butler. Specifically for the duties of coffee and coffee cake. It would greatly improve my mornings. Andrew, I hope you’re reading this, in case, um, you need Hannukah gift ideas, a morning butler would be amazing! A typical weekend morning in our household goes a little like this. Around seven o’clock, my body decides that it no longer wants to be asleep. Nevermind that I very much want to be asleep and my brain is quite content being in close contact with a pillow. But my body, well, it has other plans. My body decides that it wants to be up and about, getting ahead with the day, going to the farmer’s market, picking up groceries, figuring out the Sunday supper menu. But what my body doesn’t realize fully is that until it ingests about 2 cups of coffee, it, along with my brain, is amazingly, utterly useless. The tricky part is actually making coffee before you’ve fully woken up. This rather simple task of measuring out water, coffee, pouring the water into the machine, and pressing the “brew” button – is challenging for my uncaffeinated brain. I should do like Andrew does and just force myself to sleep a little longer, but I just wind up tossing and turning. And so I get up early and run errands before Andrew wakes up. But I am also a bit of a prima donna – mere coffee is just not enough. I want to have something that goes perfectly with coffee – a quick bread of sorts, or a coffeecake. I want a slice of it on a plate and I want to eat it on the couch, cake in one hand, coffee in another, eyes closed in sleepy bliss. Ideally, someone boyfriend a butler, for instance, would hand me both, thereby relieving me of the coffee-making duty. And then, magically, this morning butler would vanish, only to revisit me Sunday morning before taking the weekdays off. See the demands I make just in the wee hours of the day? It’s frightening to think what I might demand midday! Because it’s fall and because I’m back knee-deep in love with pumpkin, I played around with pumpkin bread a bit one day and finally narrowed it down to the pumpkin bread that houses all my favorite things: brown butter, maple sugar, bourbon, and cranberries. And because it tastes lighter than air, I am just going to assume that it is, and that half a loaf I ate for breakfast the other day will in no way find its way to my thighs. This is the pumpkin bread of my fall dreams wit hints of spice and maple, with a moist and tender crumb. It has brown butter, otherwise known as “The Thing That Makes Me Swoon”; bourbon, otherwise known as “The Thing That Makes Everything Better”; and cranberries, otherwise known as “What Olga Can’t Resist Putting Into Any Quickbread“. In short, it’s made of pumpkin heaven and fall pixie-dust. And you must make it. This week. The only downside to this bread is that I have to make it myself – no butler in the area to help me through my morning plight. I am hoping that come the holiday season, I’ll be presented with a box that will house/contain such butler. Until that happens, however, I have to just keep on baking this cake on Friday night and setting my coffee maker ready, just so that all I have to do is press the brew button. It’s my temporary butler solution before, you know, the real thing comes along. You might have noticed that things are a little different around here. For starters, the font is a bit different – I was getting tired of the old one, so I switched things up a bit. Also, the Recipe Index is now alphabetized – bonus. Seems like a no-brainer, but guess who didn’t do it the first time? Me! Also if you click on any category in the tag cloud or under the recipe, it’s now also alphabetized, but instead of entries, you get a tidy list. Awesome, right? There’s a TOTALLY NEW FEATURE too – and it’s called Tips! I’ll be posting what I think might be useful tips around the kitchen, which hopefully, will make your life a bit more pleasant and even fun (at least as far as being in your kitchen is concerned!) There’s a nifty RSS feed just for the Tips, so sign up! And lastly, there are these easy Facebook and Twitter buttons to help you keep up with Sassy Radish updates – they’re located in the top left portion of the site! Hope you like the changes. Now, go on and make that pumpkin bread! You know you want to! Oh ye without a stand or hand mixer – rejoice! This recipe requires a spatula to mix! Happy? Preheat oven to 375 degrees. Butter and flour two 8 1/2-by-4 1/2-inch (6-cup) loaf pans; set aside. 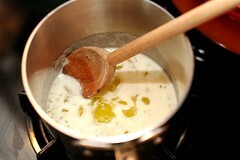 Over a low heat in a medium saucepan, cook the butter until it is warm, brown and develops a nutty aroma. This should take about 7 minutes, but don’t despair if yours takes longer, just look for the brown solids to form. At first, your butter will bubble and foam and you might think to yourself, “How do I know it’s really brown?” Relax – before you know it, the foam will subside and you’ll see the liquid butter which will then tell you if it’s ready or not! Once butter is done, turn the heat off and set it aside. 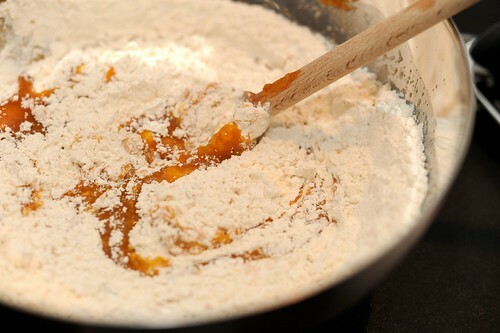 In a large bowl, whisk together flour, baking powder, ginger, and salt. In a medium bowl, whisk together both sugars, pumpkin, melted butter, eggs, and bourbon. Add the flour mixture, the cranberries and stir to just combine. Do not overmix. 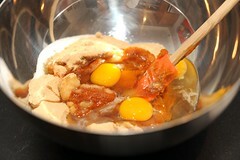 Divide batter between prepared pans. Bake for 50 minutes, rotating mid-way, until a toothpick inserted in center of loaves comes out clean. Remove from oven, and let cool 10 minutes; invert pans and transfer loaves to a wire rack to cool completely. Note: If making 1 loaf and the rest in muffins, muffins bake in about 20-25 minutes – check after 20 for doneness by inserting a toothpick. And if it comes out clean, your muffins are done. The loaf, however, will take longer! Makes 2 loaves, or 1 loaf and 8 or so muffins. 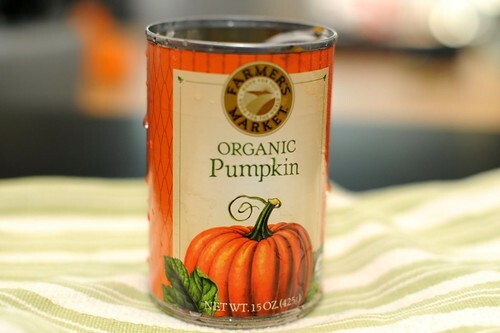 Your brown butter maple pumpkin looks so comforting! I would love a piece right now with some earl gray tea! Cranberries, pumpkin, and brown sugar — it equals True Bliss! 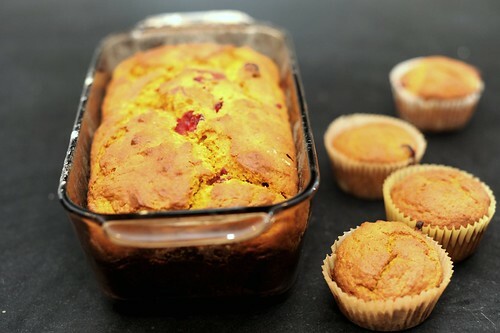 Cranberries and pumpkin together is sinfully wonderful. Thank you for sharing this recipe and how much better it would be if a butler were serving. I want it to be the weekend already so I can make this. YUM. Oh goodness these looks divine! All that maple-y pumpkin goodness…perfect with our morning coffee! mmm i recently discovered the wonders of brown butter! this bread looks fabulous! This looks fantastic! I love the combo of pumpkin and cranberry. And, of course, brown butter makes everything better. Fabulous and perfect for a cold Sunday morning. My children have started to enjoy cooking so much that they want to do it “themselves”. This looks like a great recipe for them to try, now… how do I get them up early enough so they can make this for ME in the morning! hi there, do you think I could sub maple syrup for the maple sugar in this recipe? Or, where do I find maple sugar? I can’t wait to make it this weekend! sarah – honestly, I wouldn’t because if you think about it, you will have a much more liquid batter. Is there a whole foods near you? If not, I would just use plain sugar. You could try maple syrup though and see how it goes? Just made these and went for the maple syrup sub. I used about a quarter cup of maple syrup instead of the half cup of maple sugar and I made sure the dry measurements were a little more ‘heaping’ than usual. Turned out great! I made them today with the full syrup substitute, just half a cup and no other changes, except subbed half the flour for whole wheat. Mine didn’t rise and get as fluffy as I think yours did, but still really yummy – maple sugar was about $11 for a tiny bottle at whole foods and I just couldn’t swing it! We can’t stop eating it….good thing it makes two loaves! Maple and pumpkin go so well together.